← Cold Water II – How Dry Am I? 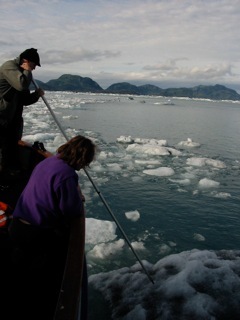 Morning at Columbia Glacier - ice blew in P.M. and we pushed it away A.M.
Lois sent me this photo of us taken on the bow of the Auklet on a cruise in Prince William Sound a few years back. I’d been to Columbia Glacier 17 years previous and was amazed to see the extent of the retreat on my return – a formerly ice-covered island was now revealed and circumnavigable. When we entered the bay in the evening to anchor and spend the night, there was not a berg or bergie bit in sight. Wind shift perhaps? We were surprised in the morning and got to work pushing (paddling?) the larger pieces away as we carefully made our way out. I look out my window to Selby Avenue and can’t see the street for the towering ridge of snow deposited by the plows. The Mississippi and St. Croix are going to be brimming this Spring unless we get an unusual series of gradual melts early on. Hopefully, no bergie bits to deal with by May 1st. I promised another tune and here it is courtesy of Bob Bovee of Bovee&Heil. The tune is Paddlin’ Blues https://coreymohan.files.wordpress.com/2011/01/gitfiddle-jim3.mp3 performed by Gitfiddle Jim also known as James \”Kokomo\” Arnold. Native Americans – and why aren’t their names on the Brule/St. Croix Portage? This morning I began to explore Native American history of the Upper St. Croix Lake to Brule River portage. The portage, as I described it in the Hallowed Ground post, is marked along the path with the names of Euro and American explorers and traders who passed that way. Conspicuously absent are the names of any Native Americans who traversed this route on their own and guided the non-natives. I want to know who those people were and still are, some names please, and in more detail than the vague references on the plaques and signage noting Indians and Native Americans that currently mark the portage. If you make it to the bottom of the post, and I hope you do, you’ll find a video clip of me demonstrating “A Different Kind of Paddling” For those who asked about my training regime, this isn’t it. Also, later this week, I hope to introduce you to 19th century Native American Leader, Ne Gon E Bin Ais (Flat Mouth) First People. I’ll stop here and let the Wikipedia folks take over. Sometime earlier than 1650, the Ojibwe split into two groups near present-day Sault Ste. Marie, Michigan, one of the prophesied stops along the path that had brought the Anishinaabe west from the Atlantic Coast. The Ojibwe that followed the south shore of Lake Superior found the final prophesied stopping place and “the food that grows on water” (wild rice) at Madeline Island. During the late 17th century, the Ojibwe at Madeline Island looked outward due to population pressures, desire for furs to trade, and increased factionalism brought by the arrival of French Jesuit missions. Having driven the Sioux out of most of northern Wisconsin and northeastern Minnesota, the Ojibwe spread throughout this region establishing bands throughout what would become northern Wisconsin and Minnesota. La Pointe on Madeline Island remained the spiritual and commercial center of the nation. The Lake Superior Chippewa was large in number that those not within the Lake Superior watershed who were identified as a separate sub-nation, known as the Biitan-akiing-enabijig (Border Sitters) as they were located between the Ojibwe of located within the Lake Superior watershed and other Nations. The Biitan-akiing-enabijig was then further divided into three principal Bands: Manoominikeshiinyag (the “Ricing Rails”, in the St. Croix River valley), Odaawaa-zaaga’iganiwininiwag (the “Ottawa Lake Men”, about Lac Courte Oreilles) and the Waaswaaganiwininiwag (the “Torch Men”, about Lac du Flambeau). Numerous sub-bands also existed. The St. Croix Chippewa Indians (Ojibwe language: Manoominikeshiinyag, the “Ricing Rails”) are a historical Band of Ojibwe located along the St. Croix River, which forms the boundary between the U.S. states of Wisconsin and Minnesota. Majority of the St. Croix Band are divided into two groups: the Federally recognized St. Croix Chippewa Indians of Wisconsin, and the non-Federally recognized St. Croix Chippewa Indians of Minnesota that forms one of four constituent members forming the Mille Lacs Band of Ojibwe. The Manoominikeshiinyag were one of the three major Bands forming the Biitan-akiing-enabijig (Border Sitters) due to their proximity to the Dakota peoples. In turn, the Biitan-akiing-enabijig were a sub-Nation of the Gichigamiwininiwag (Lake Superior Men). The St. Croix Band arrived in the area nearly 600 years ago when directed to move southward from Lake Superior to “the place where there is food upon the waters.” In establishing a presence in the St. Croix River valley and its tributaries, the St. Croix Band entered into fierce territorial dispute with the Dakota and the Fox, though eight other Native American Tribes were located in the St. Croix River Valley. To this day in the Ojibwe language, the headwaters of the St. Croix River is called “Manoominikeshiinyag-ziibi” (Ricing Rail River), the St. Croix River below the confluence of the Namekegon River as “Gichi-ziibi” (Big River) and below the confluence of Trade River as “Jiibayaatigo-ziibi” (Grave-marker River). The name “St. Croix River” was based on the “Jiibayaatigo-ziibi” name of the river. Due to the inter-relationship to the Dakota peoples, the Knife, Rice, Rush, Snake, Sunrise and Apple River Bands were considered equally Dakota as Ojibwe. Consequently, citizens from these Bands may have had Dakota names, many were of the Ma’iingan (Wolf) Doodem, and Chiefs, such as Shak’pi signed treaties both as Ojibwe and as Dakota. Thanks again for the visit. As promised, my clip. Note the skill and grace. This entry was posted in Brule-St.Croix portage, Music and Video, Native Americans and tagged Anishanaabe, Auklet, Bovee&Heil, Brule, Chippewa, Kokomo Arnold. Gitfiddle Jim, native Americans, portage. Bookmark the permalink. A true “Paddle Master” of highest order, elegant, the finest I have ever seen! Paddle on Garth!! !